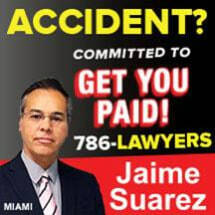 Representing those who have been injured due to the negligence or recklessness of others, we offer dedicated personal injury counsel at the Law Offices of Suarez & Montero in Fort Lauderdale, Florida. Our attorneys work to recover the maximum compensation on behalf of those we represent so they can focus on what matters most - their recoveries. Since our law offices were founded, we have committed ourselves to seeing those harmed because of car and truck accidents, slips-and-falls, premises liability and other such incidents to be made as close to whole as possible for their associated losses. Our team has helped obtain settlements, totaling in the tens of millions of dollars on behalf of our clients over the years. Having more than 35 years of combined legal experience, our team has seen firsthand the long-term effects of brain and spinal cord injuries. We know that suffering injuries due to no fault of their own may be emotionally and financially draining on people, as well as their families. During a free initial consultation, our attorneys review the details of people's cases with them and advise them of their rights and options for pursuing financial justice. Guiding people through some of the most challenging legal situations of their lives, our team at the Law Offices of Suarez & Montero is also able to represent clients in criminal defense cases. We work to help those charged with traffic violations, DUI, federal crimes, and other misdemeanor and felony offenses to achieve the best outcomes possible for their cases.